Gold is a precious metal from the Copper-cupalite family of metals. Gold is malleable and ductile and has a good resistance to chemicals. Gold is dominantly used as monetary exchange and investment and for jewellery. But gold also has many uses for electronics, food, and medicinal purposes as well as in the industry. Gold is a very special commodity due to its dominating consumption for jewellery and investments. Only an approximate 10% is used for technological purposes (Gold.org 2014). 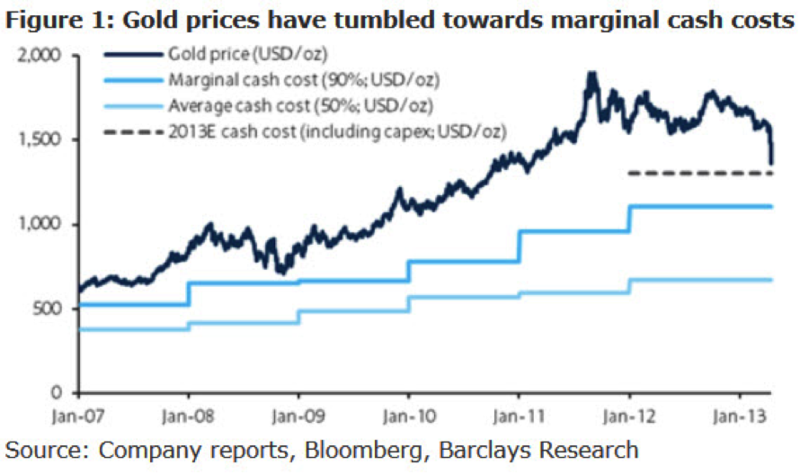 This, however, means that the gold prices and marginal production cost are closely monitored by investors banks etc. A recent figure (from 2013) estimates the marginal cost of production to be approximately $1,300/ounce and the price around $1,400/ounce (see figure below). Figure: Source Tyler Durden, http://www.zerohedge.com, accessed July 22, 2014. There is plentiful information on the gold prices/marginal production cost due to the fact that gold is an object of investment – such as Barclay Research Centre or The Gold Yearbook by CPM-group. The latest information can, however, be hard to get by since one has to subscribe/pay to get at the most recent prices. To illustrate this example we have therefore used secondary sources.